Come and discover our region with its wonderful landscapes. 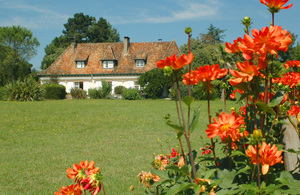 Enjoy the stay at the MANOIR de MARSAN, the "Suite", the pool and the flowered park. Bask in the peace and perfumes of nature. Your cosy "Suite" is nestled in a secluded 1 hectare 650 landscaped park, yet a five minutes walk will take you to the classified medieval site of SAUVETERRE DE BEARN, situated on the way to Compostela, one hour drive away from beaches, mountains and Spain, and half way between PAU and BIARRITZ. You'll be warmly welcomed by Nicole and André CAPDET who will do their best to share with you the love and enthusiasm they feel for this peaceful paridise. Sitting by the pool or on the terrasse, you'll enjoy a full view of the Pyrénées, beyond the bright colored flowers of the park. Winter will see you by the fireplace, or playing on the grand piano, relaxing in the exceptional quality of life SAUVETERRE DE BEARN has to offer. Access by the BAYONNE - TOULOUSE highway A 64, exit at SALIES DE BEARN (Exit n° 7) and follow the signs to SALIES DE BEARN and SAUVETERRE DE BEARN. When in SAUVETERRE DE BEARN, take "rue Pannecau" on the side of the "Mairie" (City Hall) to the first STOP sign, turn right and, 20 m further, turn left into a dead end lane. At the end you see the white gate of "MANOIR de MARSAN". (Signs indicating MANOIR de MARSAN are posted starting at the STOP sign.